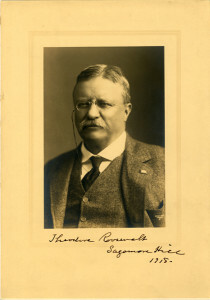 Attractive sepia tone photograph of the twenty-sixth president of the United States, Signed on the mount (which is an integral part of the photograph) below, “Theodore Roosevelt / Sagamore Hill / 1918.” The photograph measures 4 inches wide by 6 inches high; overall measurements are 7 inches wide by 10 inches high. Theodore Roosevelt served as President of the United States from 1901 to 1909. Framed (with inner and outer mats in taupe with a decorative silver frame) dimensions: 12 1/2 inches wide by 15 1/4 inches high.